This is a recipe from Rebel Chef Noel Fernando. Many of us do love steak, but are afraid of trying to cook it at home. A nice piece of meat, even at the grocery store, can be expensive, so we don’t want to risk over-cooking or seasoning incorrectly. I understand where your fears are coming from, friends, and I’m here to talk you through it. Believe me, steak intimidated me for a long time. 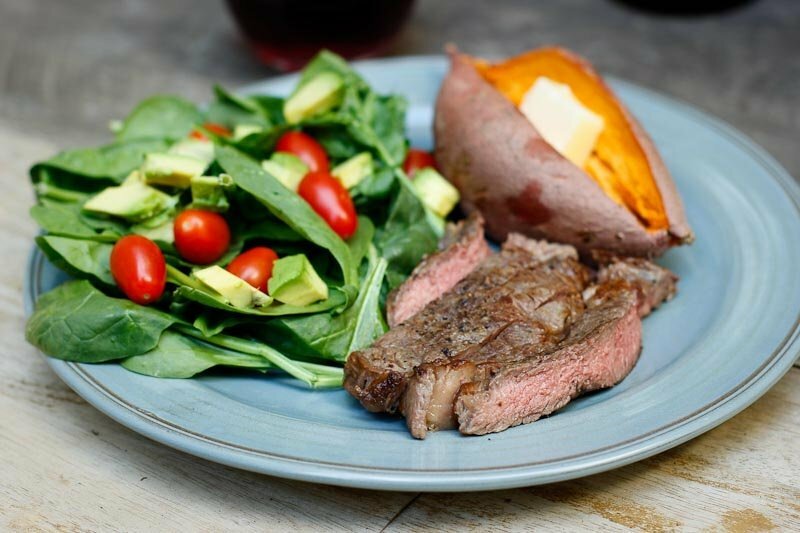 If you’ve been wanting to try cooking your own steak at home, this recipe couldn’t be any simpler. Get ready to level up your cooking game and make yourself gosh darn proud! This steak is super easy. It takes 15 minutes and only uses 4 ingredients. Enough talking. Let’s get to cooking! 1 steak (1/2 lb or 226g per person) – if this is your first time cooking a steak, get a ribeye. It’s hard to go wrong with this cut. Ribeyes are well-marbled, tender pieces of meat, with a mid-range price. If you can afford it, spring for grass fed beef. It tastes better. An ideal ribeye is about an inch thick. Some places give you the option of bone-in or boneless. I usually go with boneless, but this is just personal preference. 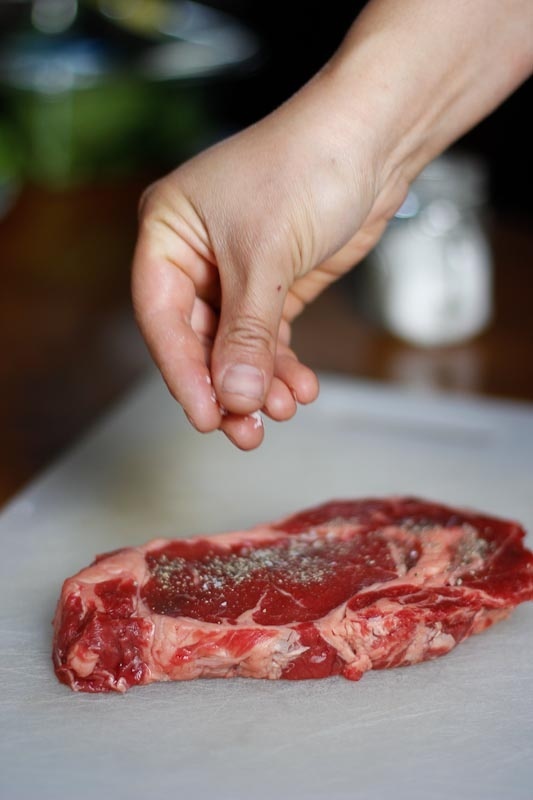 Coarse sea salt – using coarse salt for cooking steak changed my world. If you want your world rocked and you’re going to be cooking meats often, get some high-quality coarse salt. You won’t regret it. Freshly ground, coarse black pepper – the best way to control the coarseness and freshness of your pepper is to buy a pepper mill. This is a pretty decent investment for a new cook. If you like the taste of pepper, nothing beats having it freshly ground. If you don’t have it, regular pepper obviously works too! 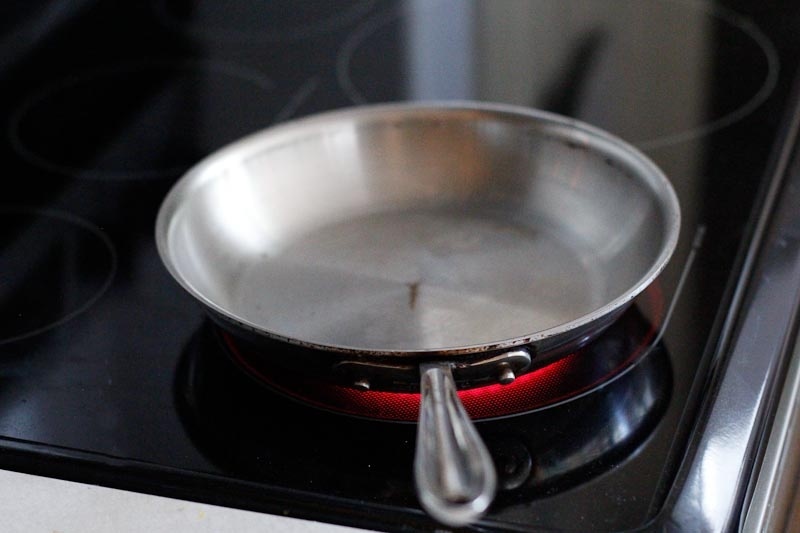 Frying pan – Please use an all-metal pan (cast iron or stainless steel are great). You’ll be placing it in a hot hot hot oven, and nothing ruins a meal like melted, burned plastic inside your oven. Womp womp. Tongs – One of my favorite pieces of equipment in the kitchen. If you don’t have a pair of tongs, get yourself one. You’ll wonder how you ever lived without it. Cutting Board – Any will do, but plastic is best for staying sanitary when cooking with raw meat. Meat thermometer (optional) – I’ve mentioned this magical little piece of equipment before. If you never ever want to have to worry about over or under cooking your meat, buy this thing. It makes everything so much easier. Your steak, chicken, pork chop, etc. will be cooked to perfection every time. 2. Next, heat your pan and the oven. Set the oven to broil (or high, if that’s an option), and heat your pan on medium-high heat for about 5 minutes. 3. 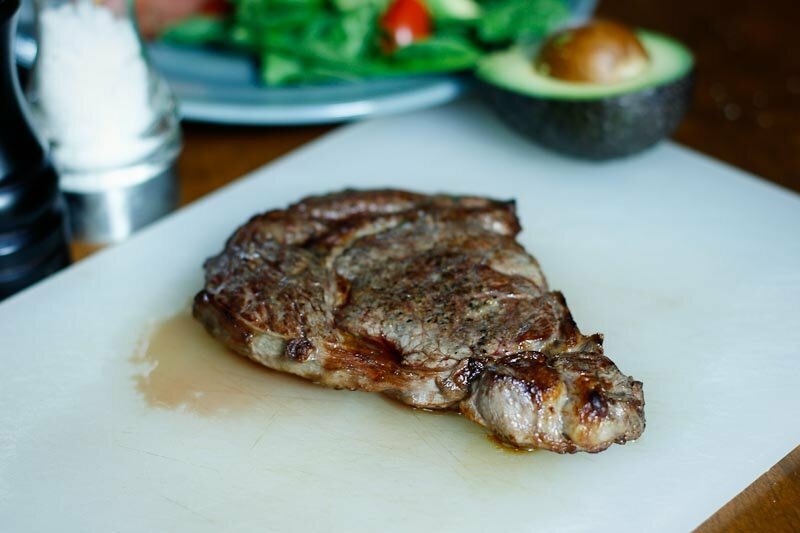 While the pan and oven are pre heating, take your steak out of the package and place it on a cutting board or plate. Pat it dry with some paper towels. Having minimal moisture on the meat will ensure the most contact between the actual meat and the pan. You’re shooting for no liquid in between. 4. 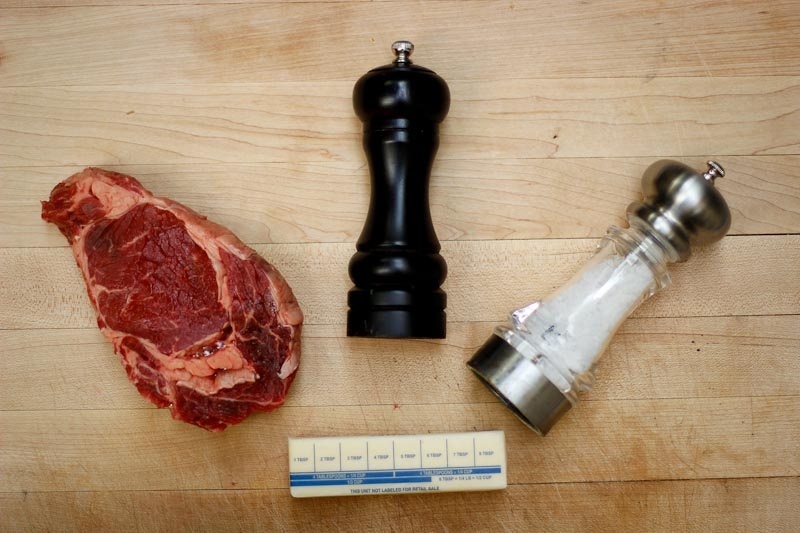 Next, sprinkle some salt and grind pepper onto both sides of your steak. Easy enough. If you want to get really fancy and plan ahead, salt your meat and then let it sit uncovered in the refrigerator over night. The salt will break down some of the muscle tissue and re-absorb some of the moisture. 5. This is where things start to happen quickly. Make sure you’ve read through the rest of the recipe so you know what comes next! I suggest you also have a stop watch or timer with you. 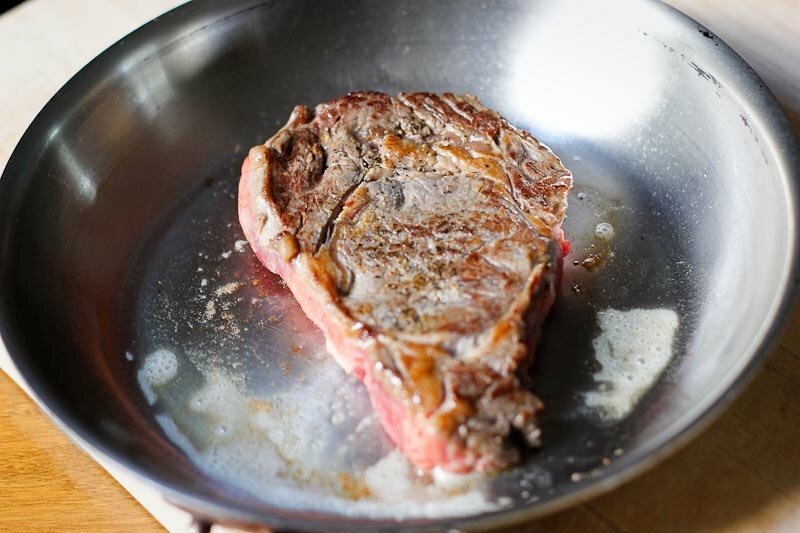 Plop your butter or ghee into the pan, and place your steak right on top of it. The steak should sizzle right away. Oh yeah. After 30 seconds, use your tongs to flip the meat. Your steak should have a nice brown caramelization on the side you just seared. This is called the maillard reaction, and it is delicious, beautiful thing. 6. Let your beautiful steak cook for another 30 seconds on the second side. Now both sides will be caramelized brown, but the middle will still be raw. That’s okay. Move on to step 7. 8. 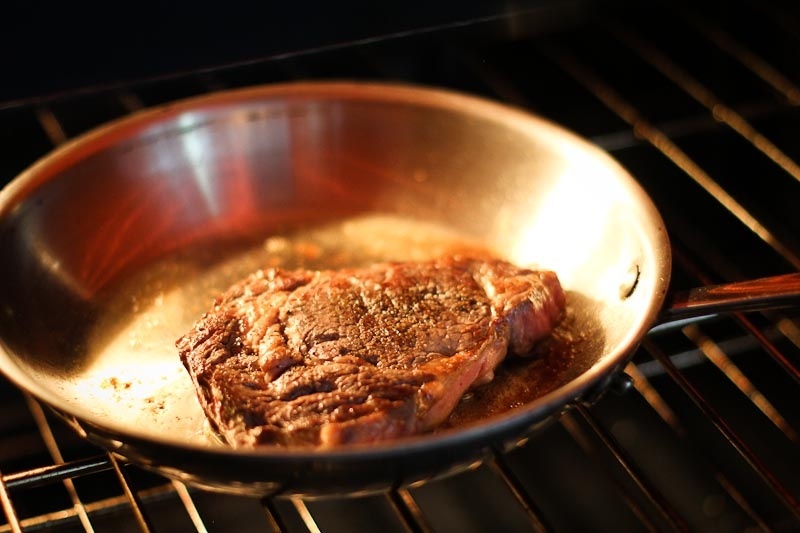 In order to get a medium-rare steak, it will need to sit in the broiler for approximately 2 minutes. Yes, that’s right. Only 2 minutes. 9. After those two minutes are up, grab an oven mitt and pull your steak out of the oven. But don’t slice into it yet! 10. 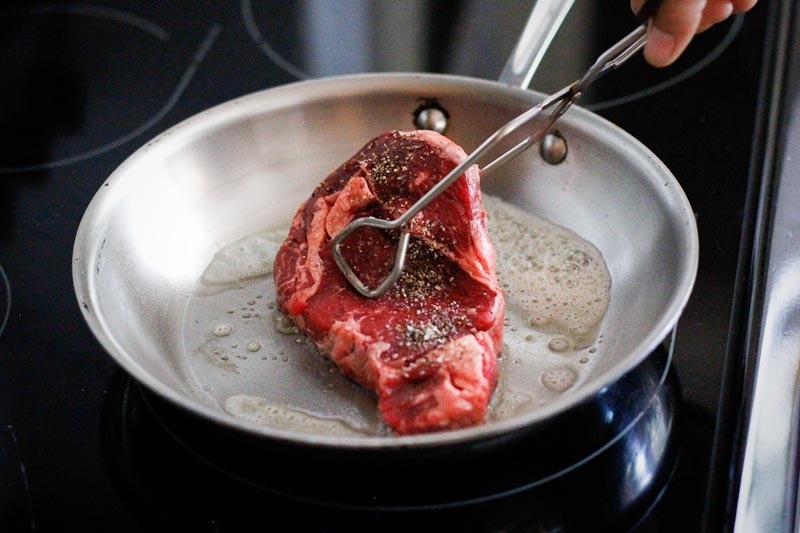 Remove your steak from the pan with your tongs and place it on a cutting board or plate. If you’re using the same board/plate from step 4 (seasoning), you’ll want to wash it first! No mixing cooked and raw surfaces! Let the steak rest on the plate, covered in foil, for about 10 minutes. This could be the longest 10 minutes of your life. While you’re waiting, fix up a salad, put some veggies on your plate, cut your sweet potato in half, or play some Tetris. 11. Eat up! Congratulations! You just cooked your first steak! 10 points to Gryffindor! The weather’s getting warmer, and summer is a time for grilling. Not all of us Rebels have access to a grill, but that doesn’t mean we don’t deserve a big juicy steak every once in a while! Now, I’ll be the first to admit this makes a pretty plain piece of meat. If you’re buying high quality beef, this is probably all you’ll need to make it taste amazing. However, some people’s taste buds might want a little more. Feel free to experiment with dry rubs, marinades, herbs, and spices of any kind (more of these higher-level recipes coming soon!). As always, if you’re sticking to paleo, read the labels! In any case, follow the 10 steps above, use these 4 ingredients, and it’ll be one of the tastiest, prettiest home cooked meals you’ll put on your plate. Be proud of your mad skills! What’s your favorite way to cook a steak? Marinades? Rubs? What other recipes would you like to see?